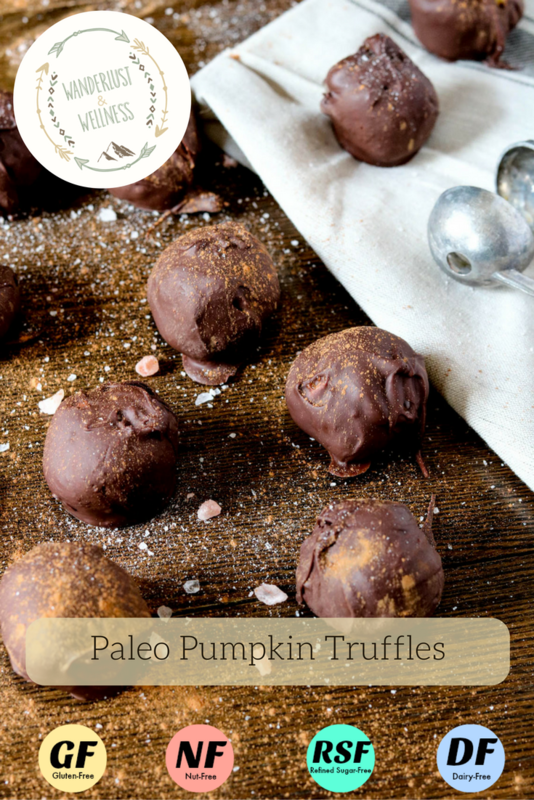 Paleo pumpkin truffles that are dairy-free AND refined sugar-free?!? Sign me up! I had to play with this recipe a couple of times before I got it right but the end result is DE.LIC.IOUS! These would be perfect for your next fall potluck or as a Halloween treat for the kiddos. You’ll feel good knowing you’re not giving them treats full of mystery ingredients or refined sugars. These are also the perfect bite-sized treat when you’re wanting something sweet but not too much. Paleo Pumpkin Truffles Prep Time: 10m Cook Time: 40m Total Time: 50m Servings: 15 Author: Jennifer Shreckengost – 1 cup pumpkin puree – 1/2 cup coconut butter – 1 tsp. pumpkin pie spice – 1/2 cup canned coconut milk – 4 tbsp. pure maple syrup – Himalayan pink salt – Cinnamon – 1 bag Enjoy Life semi-sweet chocolate mini chips 1) Add all ingredients except for the chocolate chips into a food processor and blend well. 2) Pour mixture into a bowl, cover, and store in the refrigerator for at least 30 minutes. 3) Add mini chocolate chips to a small mixing bowl and melt according to package directions. 4) Once chocolate is melted, remove pumpkin mixture from the refrigerator and begin assembling your truffles. Using a small mellon baller or other scoop, scoop out the pumpkin mixture into about 3/4 in. ball, rolling in between hands to make a nice round ball. 5) Using two forks, dip the ball into the chocolate, gently shake off any excess chocolate and place onto a lined baking sheet. 6) Repeat this process with the remainder of the pumpkin mixture. 7) Place the baking sheet into the refrigerator for about 10 minutes to harden further. 8) Sprinkle with cinnamon and salt. 9) Store in the refrigerator. 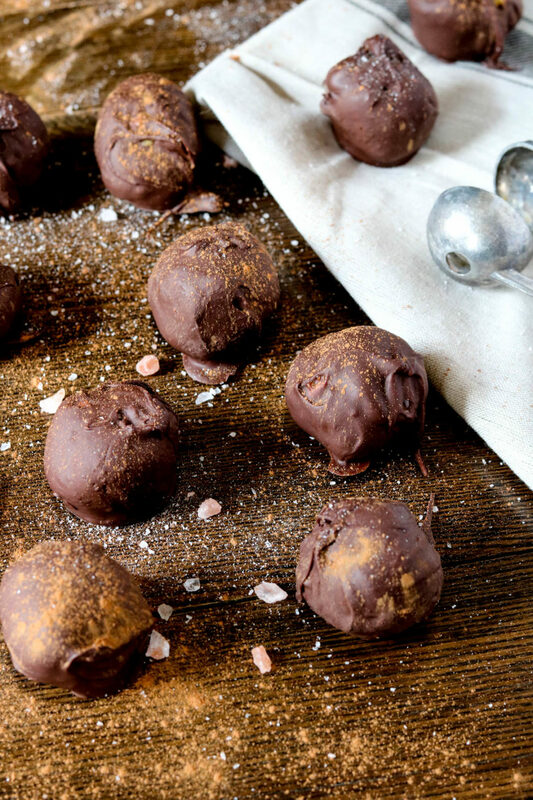 These truffles look sooooo good! I love pumpkin and chocolate together! Cannot believe they are paleo!